Click on the picture to see an enlarged view of the vineyard today. The picture is updated from sunrise to sunset daily. For up-to-date pass conditions, check the Washington State Pass Report. We'll see you later this morning! We are only 2 1/2 hours via Interstate from Bellevue. We are only 172 miles from Portland Oregon. Have a safe trip. No tasting fee with wine purchase. $5.00 otherwise. Winter has finally arrived, but here on the deserts of eastern Washington we seldom get snow. If we do, we plow the driveway and clear the sidewalks. It is a quiet time of year, the wine in sleeping in the cellars and the staff has time to talk to you individually. Check out the Tote and Taste program from Alaska Airlines. (Yes, Yakima does have an airport!) If you check your wine in Yakima (YKM), it flies for free on any airline. We have some great case specials. Sign up for our newsletter to get unadvertised specials. Come visit us. Real wine country is just 2 hours east of Issaquah via freeway or 25 minutes from SeaTac on Alaska Air. If you are planning a trip to visit Washington wine country, you will find it very different from California wine country. Most of the Washington wineries are located in industrial parks, strip malls, downtown store fronts, and old airports. Even if a winery is an estate winery, the tasting room may be located miles from the vineyards. If you are planning a trip from Seattle to visit Red Mountain, Tri-Cities, or Walla Walla wineries, you drive right past our winery on I-82, only 2 1/2 hours out of Seattle. Stop in and see us. You walk through our vineyards to get to our tasting room. The grapes you see make the wines you drink. Bonair Winery is situated in the Rattlesnake Hills of the Yakima Valley, Washington State's foremost wine growing region region. 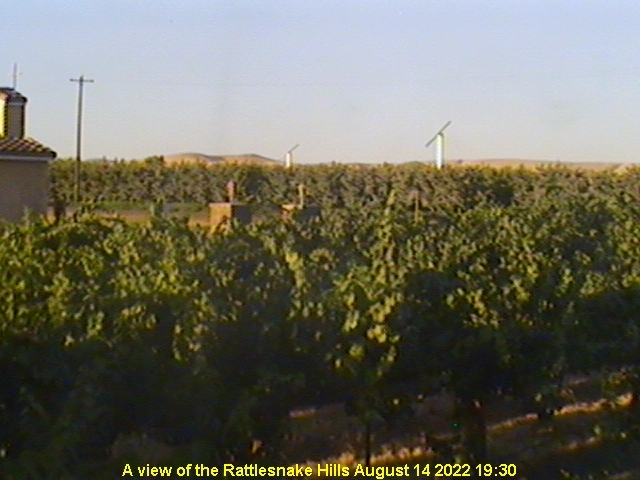 No, we don't have rattlesnakes in our vineyards. Every March 17, St. Patrick's Day, we drive the snakes out of the vineyards. This is Washington States most scenic wine country. In the Rattlesnake hills you drive through orchards and vineyards, just like wine country is supposed to be. Like Bonair, our neighbors are Estate Wineries, also. We have a close connection to the soil. In the desert, there is a great differential between daytime and nighttime temperatures, sometimes over 40o. These cool evenings preserve the natural acid in the grapes while daytime temperatures develop sugars. This results in a perfect sugar/acid balance. Without untimely and damaging natural rainfall in the Yakima Valley, we can precisely regulate the amount of water the plants receive to ripen grapes to perfection with the use of drip irrigation. Drip irrigation preserves water, a precious commodity in the desert West. Does it bother you that your wine had a better vacation than you? Did you get to Summer in Australia? Live in a bodega in Chile? or spend time in Bordeaux? We support the locavore movement. Your food shouldn't travel any more than you. Travel globally, but eat locally. Did you know that only one bottle in four consumed in Washington was produced here. Save the planet. Drink Washington wine. Most people think Seattle is Washington. Well, politically speaking, it is, but east of the Cascade Range is a vast desert that receives as little as 5 inches annual rainfall. That's less than Phoenix, Arizona. It is a perfect climate for Vitis Vinifera, the European Wine Grape. We get 17.4 hours of sunshine in the summer, 2 hours more than the fellows down in California. Washington is on the same latitude as the famous wine regions of France. As you can see by the map, California is on a different latitude. You are visitor number 608675 . ©2010-19 Bonair Winery, Inc. All rights reserved. 2010-15 Bonair Winery, Inc. All rights reserved. ©2009 Bonair Winery, Inc. All rights reserved.